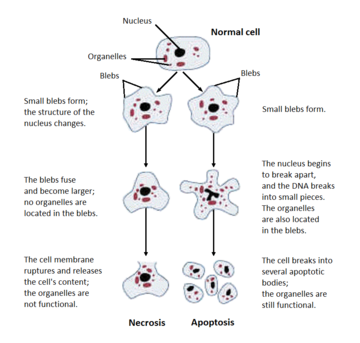 ^ a b c d “Necrosis: a specific form of programmed cell death?”. Exp. Cell Res. 283 (1): 1–16. (2003). doi:10.1016/S0014-4827(02)00027-7. PMID 12565815. ^ a b c d e f g Understanding pathophysiology (1st ed.). Chatswood, N.S.W. : Elsevier Australia. (2010). ISBN 0729539512. ^ a b c d e f g h i j k Robbins and Cotran pathologic basis of disease (8th ed.). Philadelphia, PA: Saunders/Elsevier. (2010). pp. 12–41. ISBN 1416031219. ^ a b c McConnell TH (2007). The nature of disease: pathology for the health professions. Baltimore, Mar. : Lippincott Williams & Wilkins. ISBN 0781753171. ^ Sattar (2015). Fundamentals of Pathology (2015th ed.). Chicago, IL: Pathoma LLC. pp. 5. ISBN 978-0-9832246-2-4. ^ a b Wheater's basic histopathology: a colour atlas and text (4th ed.). Edinburgh: Churchill Livingstone. (2002). ISBN 0443070016. ^ “Cancer resistance in the blind mole rat is mediated by concerted necrotic cell death mechanism”. Proc. Natl. Acad. Sci. U.S.A. 109 (47): 19392–6. (2012). Bibcode: 2012PNAS..10919392G. doi:10.1073/pnas.1217211109. PMC: 3511137. PMID 23129611. https://www.ncbi.nlm.nih.gov/pmc/articles/PMC3511137/. ^ a b c d e f g Raffray M, Cohen GM; Cohen (1997). “Apoptosis and necrosis in toxicology: a continuum or distinct modes of cell death?”. Pharmacol. Ther. 75 (3): 153–77. doi:10.1016/s0163-7258(97)00037-5. PMID 9504137. ^ “Warfarin-induced skin necrosis”. J. Am. Acad. Dermatol. 61 (2): 325–32. (2009). doi:10.1016/j.jaad.2008.12.039. PMID 19615543. ^ Yanagawa, Youichi (10 October 1980). “Cutaneous hemorrhage or necrosis findings after Vespa mandarinia (wasp) stings may predict the occurrence of multiple organ injury: A case report and review of literature”. Clinical Toxicology. ^ a b c d e f g “Classification of cell death: recommendations of the Nomenclature Committee on Cell Death 2009”. Cell Death Differ. 16 (1): 3–11. (January 2009). doi:10.1038/cdd.2008.150. PMC: 2744427. PMID 18846107. http://www.nature.com/cdd/journal/v16/n1/pdf/cdd2008150a.pdf.